Huanglongbing (HLB), also known as citrus greening, is thought to be caused by the bacterium Candidatus Liberibacter asiaticus. 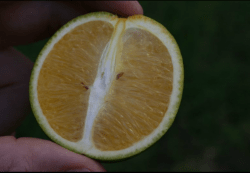 HLB has seriously affected citrus production in a number of countries in Asia, Africa, the Indian subcontinent and the Arabian Peninsula, and was discovered in July 2004 in Brazil. Wherever the disease has appeared, citrus production has been compromised, with the loss of millions of trees. HLB has not been reported in Australia or in the Mediterranean Basin. In August 2005, the disease was found in the south Florida region of Homestead and Florida City. 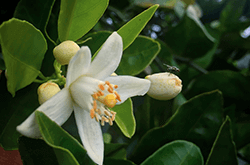 Since that time, HLB has been found in commercial and residential sites in all Florida counties with commercial citrus. 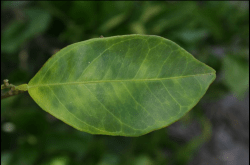 The early symptoms of HLB on leaves are vein yellowing and an asymmetrical chlorosis referred to as “blotchy mottle.” The blotchy mottle symptom is the most diagnostic symptom of the disease, especially on sweet orange. Leaves may be small and upright with a variety of chlorotic patterns that often resemble mineral deficiencies such as those of zinc, iron, and manganese. Some leaves may be totally devoid of green or with only green islands. Root systems of infected trees are often poorly developed and new root growth may be suppressed. Early symptoms of yellowing may appear on a single shoot or branch. The yellowing usually spreads throughout the tree over a year, especially on young trees, and affected trees may show twig dieback, causing the productivity to decline within a few years. Fruit are often few in number, small, may be lopsided with a curved central core, and fail to color properly, remaining green at the stylar end. Many fruit drop prematurely from afflicted trees. A yellow stain may be present just beneath the peduncle (stem) on a cut fruit, as in the image shown here. The affected fruit often contain aborted seeds and have a salty bitter taste.